So, I went and saw Moon today. It's one of those perfectly good little movies that deserves more attention than it's gotten. The last one of these that I saw was 'The Illusionist', and if I had to chose, I'd say I liked 'The Illusionist' more, but that doesn't take anything away from Moon, they're both great little movies. I shall try to avoid spoilers in what is to follow, but it's going to be near impossible for me to do that totally, I'm afraid. This could be a shot from 'Solaris' or 'Space 1999'. Notice the font used for the '03 BAY' sign. I saw that same font used for the seat-numbers in the terribly run-down little cinema that I saw this in. I suspect those seats date back to at least the 80's or 70's, and at that time this font was considered futuristic. Moon portrays a future I'm familiar with from my childhood in the 70's and 80's. Normally, I'd rate that as a bad thing, but Moon is doing this consciously and deliberately, and thus turns something that would normally be lazy world-building into a clever retro-kitzch theme. However, now that Duncan Jones has done it, I don't think it can be done again. But, let me say more about that retro-feel. I spotted references to movies like Outland, 2001 a Space Oddessy, Dark Star, and possibly Solaris and Silent Running. There were probably many others that I missed. These are done in a non-obvious and deniable way, and thus you can no doubt argue endlessly if they are really there. I'm pretty sure they were. The exterior moon-scenes are done with models. Yes, models. You remember them, right? I sat to through the credits to see if I was right about this, and yes, model-makers were credited at the end. It might be that the models were used for mock-up shots, and all the actual stuff we see is CG, but I doubt it. 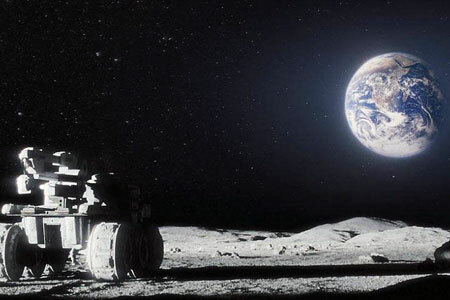 I suspect that models have been used for the things that models do well (moon-buggys and buildings) and supplemented with CG for those things that CG does well (the 'spray' from the moon-harvesters) Its interesting that the exterior shots look completely convincing, and yet you somehow know they've been done with models. They don't have the hyper-real look that tips you off that it's CG. I actually think that the models look more grounded and real than CG, in some way I can't put my finger on. But then again, this is probably because this tight little film keeps the exterior shots to those things that models do well (setting it on the moon is a good idea in this regard, because there's no annoying plant life or critters that you'd model unsuccessfully). The film has some wonderful attention to detail. The main characters space-suit is filthy from all the work that's been done in it, something we hardly ever saw even in the otherwise grimy 'Alien'. The harvesters leave tracks of disturbed moon-dust that look like ploughed fields. I had only two technical peeves. Firstly, we frequently heard sounds on exterior shots, when we shouldn't have. (No air on the moon to carry sound). It's arguable that the sound of hatches banging shut might be carried to the listener via the ground or what-have-you, but there is a long tradition of having us only be able to hear the character's breathing in their suit, and I feel this would have worked better. For one thing, it's got a sinister edge, this disconnection from sound gives everything a dangerously 'floaty' feel, and sets one into a mindset that expects disaster. The second peeve is that the lower gravity on the moon is ignored. I was happy to ignore this, because it would probably get expensive to portray low gravity, and would be distracting to the viewers. However Moon seemed to go out of it's way to remind me of that it was 'magicking away' the issue. For instance, a game of ping pong instantly had me thinking "The ball will bounce out of control". And at one point, a character skips across the surface like the Apollo astronauts, therefore referencing the low gravity, but when they return to the moon-base, evering is at 1G again. If you look at the interior shots above, there's a sticker on the floor that says "1G", so I guess the movie-makers knew they were breaking the laws of nature. However, it would have been better to drop the ping-pong and moon-skipping, and then I'd have been able to put my physics-geek objections in a box and sit on the lid for the duration of the movie. However, Moon kept disturbing said objections, causing them to burst from the box and throwing me bruisingly out of suspension-of-disbelief. However, these peeves are small petty things. This is a great little movie that I'd recommend to anyone who wants a break from block-busters that constantly set fireworks off in your face. This is a laid-back, contemplative movie with a quiet emotionality. It's mostly about the interplay between the three characters. The human(s) behave, from time to time, like complete idiots, getting into fights, and generally not handling things well. But then, they are under a lot of pressure, I guess. Gerty, the base computer/robot, who is the third character can be surprisingly effective, even though he exhibits emotion mostly via a 'smiley face' emoticon. One or two simple scenes will pull the emotional levers sufficiently to make your vision mist, and the ending is satisfying and plausible, even delivering a laugh. It's not a roller-coaster, but it will leave you feeling pleased you went to see it.